Droooool... I love this pineapple Christmas Tree. Has anyone ever made anything like this? I've never used the fabric stiffener with thread crochet. Oh wow ... that's amazing. I can't imagine making something like that! I have made Angels and snowflakes. I have wanted to make that tree, but haven't gotten around to it. Anyway, I use a product called Aleene's Fabric Stiffener & Draping Liquid. With this, if I need to, I can also add water to make it thinner. You can also use Elmer's glue and water. That is suppose to work. I used the glue and water mixture on my snowflakes this year. It really does a great job. Just remember equal parts. That tree is wonderful. I'd like to try that sometime myself. that's a beautiful Christmas tree!!!!! What a beautiful tree! I've not gotten up the courage to try anything like that....one of these days! Wow! That is so beautiful! I've never seen anything like it. Wow, that is gorgeous! I have used the glue and water stiffener. It's a little messy, but works really well. I made this tree and stiffened it with Aeleene's (sp?) Stiffener. It was easy to stiffen. That pineapple pattern is so much prettier. The $16 includes the thread, beads AND pattern, which might be a bit easier to swallow. 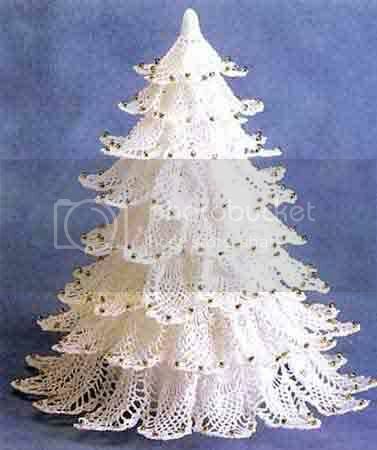 http://www.ravelry.com/patterns/library/christmas-tree-10 not quite as detailed..
Also if you do a search on ebay for a "crochet pineapple Christmas tree pattern", the written pattern only is for sale cheaper than this kit.